We attended the gala opening party for Montage Beverly Hills in early December, and it was one of the best opening parties we have been to. And now that the hotel has settled in to providing wonderful luxury experiences for hotel guests, we thought it would be a good time to catch up with one of our favorite hoteliers in the world, Ali Kasikci, Managing Director of Montage Beverly Hills. 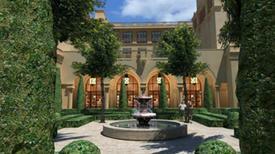 Tell us about Montage Beverly Hills, the first luxury hotel to open in Beverly Hills in 16 years. "Montage Beverly Hills is not only the first luxury hotel to open in Beverly Hills in 16 years, but additionally the first urban hotel to open for Montage Hotels & Resorts, following the very successful opening of our sister property in Laguna Beach 6 years ago. With nearly 7 years in the development process, it allowed our CEO and Founder Alan Fuerstman, together with a talented group of individuals, to come up with a design/ concept, that was, in our opinion, unfulfilled in this marketplace. The footprint of the hotel, the adjacent Montage gardens, the 20,000 square foot Spa Montage and gym, unique dining venues with attractive private dining rooms attached, and the ratio of suites to guestrooms fills that void — not to mention the walking distance to desired destinations in Beverly Hills." What is your role as the Managing Director of this new hotel? "The role of a Managing Director today is very different due to challenges associated with current economic conditions. These conditions require innovating complete new management and leadership principals and practices. Rather than relying on practices which made us successful in the past, one must now shift to management innovation- focusing on allowing the grossly underutilized resources, such as creativity, passion and intelligence, to become the mainstay rather than focusing on practices revolving around conformance, obedience and diligence. In short, the role of a 21st century Managing Director is to create a context in which everyone can be a leader. " How will you draw on your past experience to achieve success at Montage Beverly Hills? "I have always said that prior successes are no assurances of future outcome. History may have repeated itself in a slow spinning world, but today’s world is very fast paced. In the 21st century the only way to remain relevant is to constantly reinvent yourself and your organization- you cannot wait for cycle that may never come. My previous achievements are exactly what they are “previous.” I have always said that your strategy should be written in pencil. My goal at Montage Beverly Hills is to write a complete new chapter. " You are credited for leading the Peninsula Hotel in Beverly Hills to become the first five-star and five-diamond property in Southern California, and keeping it at peak performance during your tenure for 16 years. "That is what has been rumored…but honestly, isn’t this the job that we are employed to do? The most interesting part of those 16 years was creating success despite varied economic cycles. In many ways, my realization of what it takes to be a leader in the 21st century started then by experimenting with concepts such as strategy reinvention and operational innovations. Both of which I can say have now become the foundation for my new zest for management and leadership innovation. I am very pleased with that chapter, which has provided me the opportunity to launch this new exciting chapter of my career. " You are also credited with inventing the flexible 24-hour check-in. Is that an example of what you mean by “changing the rules”? "At its essence, the purpose of our business is to create and keep a customer- therefore; the organization must at all times have a customer centric culture and focus on delivering results for the guest. The flexible 24-hour check-in was a manifestation of this customer dedication. " How is Montage Beverly Hills changing the rules? "In keeping with what I have said above, we cannot wait for the guest to verbalize what they are looking for- it is our responsibility to observe the cues and connect the dots to create unparalleled value. In principle, it is finding solutions to unarticulated needs and desires and operationalize those solutions, which will then yield “game-changing” strategies. " How do you continue to differentiate your hotel when your competitors catch on and implement the new services you are creating? "There is no greater compliment to an hotelier than seeing duplication of one’s practices become industry standards…After all, best practices across the board, help us all and provide a positive contribution to the service industry as a whole. " Tell us about the strategic advantage of Montage Beverly Hills. "The facilities itself set Montage Beverly Hills apart; the high ratio of suites to rooms, the unparalleled Spa Montage with co-ed mineral pool and relaxation area, the classically elegant decor with the latest, user-friendly technological design, all complemented by the Montage gardens and ideal Beverly Hills location. These product attributes combined with a customer centric culture, and the highly regarded Montage Hotels & Resorts brand, will well position Montage Beverly Hills in this established marketplace. " You have taught master classes at the Cornell School of Hotel Administration, including one on leadership. Why do you teach? "Of course, it is a pleasure to give back to an industry that has given me so much. But the truth is that teaching is the best form of learning. I view my hotel as a laboratory for research, putting new ideas into practice, adjusting and refining them. Teaching is how I share the results of the research and get feedback. It is quite fulfilling. " What do you look for in employees — how do you hire new talent? "This is something that has changed over the years. In this era, we should not do not focus primarily on experience and skill, yet more so on attitude. You can teach skills. But it is difficult to teach the attitude that is necessary for a service orientated organization like ours. You look for people who are aligned with the purpose of the hotel, and the values of your organization. No one is infallible, everyone makes errors, however, if you are open to learning the right skill set, and bring the right attitude, you will be successful. " You are opening a hotel in the midst of a worldwide economic crisis. How are you addressing this reality? "Predicting the future is best left in the hands of fortune tellers and witch doctors (and I add, not all that successfully). I have always subscribed to the maxim “the best way to predict the future is to invent it.” That said, bringing into market a new product in one of the most desired locations, combined with the philosophy of Montage Hotels & Resorts, and global thinking with local knowhow gives us all the tools necessary to position our self as a force in this marketplace, despite economic realities. If one subscribes to the notion that, “the rising tide may lift all the boats the same, it is the low tides that expose those who are swimming naked.” One could say that when the tide is low, the commitment of the organization and the skill of the management team will become the differentiator that sets one apart." What advice would you give to young hoteliers just starting their careers? "Don’t be clever, be conscientious. Essentially, remember most of the knowledge and skill you need to be successful is already present within the organization. Your job is to tap into and align yourself with the purpose of the organization. Management today is not just managing down, but also, up, out, and across. It is up to each of us to manage ourselves, to continue to develop our skills. Ultimately, you will be measured by the results you deliver. In my opinion, results are equal to the relationships you have, times the credibility you carry. Therefore, build relationships and develop credibility. " What do you do to balance your work and your life, Mr. Kasikci? "This is my next challenge… "
Montage Hotels & Resorts is a luxury hotel and resort management company founded by Alan Fuerstman in 2002. He selected the brand name “Montage” to reflect the artful assemblage of unique properties in stunning settings, each with residential-style elegance, distinct sense of place and the highest quality services and amenities. The company’s first and flagship oceanfront resort, the 250-room Montage Laguna Beach, opened in February 2003 in the vibrant arts community of Laguna Beach, California. Other properties under development are in Cabo San Lucas, Mexico and Deer Valley, Utah. Ali Kasikci is one of the great hotel leaders of the world, earning many international awards, including recognition in 2004 as “Hotelier of the World.” He began his career in Europe and after several hotel management positions in Germany and then South Africa, he moved to the U.S., managing the Four Seasons at Newport Beach, and then on to the Peninsula hotel in Beverly Hills, where he was the Managing Director, leading the hotel to become the first (and only) five-star and five-diamond hotel in Southern California. He was appointed Managing Director for the Montage Beverly Hills in September 2007, opening that hotel in November 2008. Ali seeks to achieve even higher levels of service and luxury at Montage Beverly Hills than in his previous positions. Ali is a graduate of the Hotel and Catering College in Tegernsee, Germany, earned an MBA from the Peter F. Drucker Graduate Management School at the Claremont Graduate University, and teaches master classes at the Cornell School of Hotel Administration.